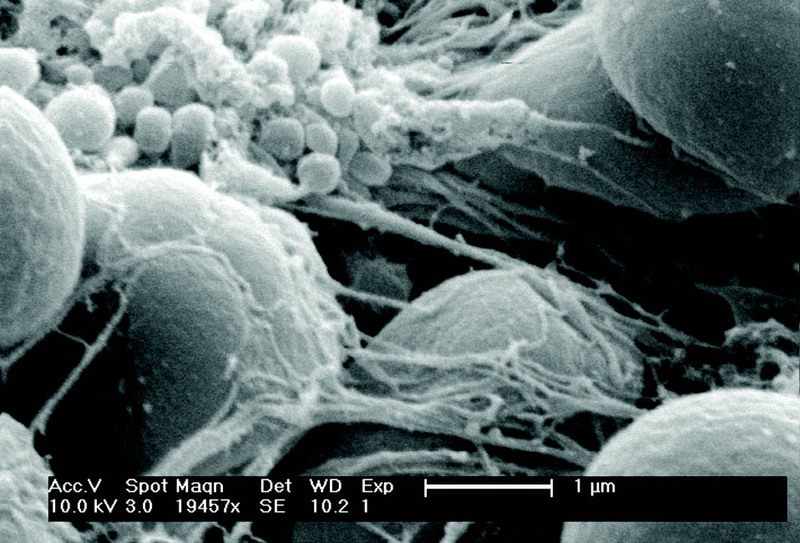 Normally, when an injury occurs, there are a series of events that activate platelets, and these activated platelets bond together and produce a network of fibers that form a clot and stop bleeding. However, following severe injuries, the platelets may not be able to stop bleeding effectively. We are developing a strategy to halt bleeding that leverages biology by using a nanostructure that binds with activated platelets and helps them to aggregate more quickly. These synthetic platelets are based on polymers that are already in use in the medical device and pharmaceutical industries and have a strong track record of safety. We now have data showing that these particles increase survival in both the short and long term after injury, and our latest projects focus on collecting the necessary data to optimize these particles for moving them towards the clinic. We have developed a process to use screen printing or silk screening to make new tissue models. These models allow integration with sensor technologies and microelectronics as well as high throughput imaging and quantification. While 3D printing has been around a number of years and has led to many new tissue models, this approach is fast, simple, and avoiding some of the shearing issues that can be a challenge when dealing with certain cell types like neural cells. There are more than 2 million people with glaucoma in the U.S. and 67 million worldwide. In glaucoma, the retinal ganglion cells (RGCs) die leading to loss of vision and blindness if untreated. The majority of cases of glaucoma are associated with elevated intraocular pressure (IOP), and decreasing IOP reduces or eliminates degeneration in 90% of patients. Eye drops are the primary means for lowering IOP, but to be effective, they must be administered a number of times a day leading to low patient compliance. If one could administer a formulation that lasted 3-4 months, the time between ophthalmologist visits for glaucoma monitoring, one could overcome the compliance issue. Therefore, we have developed a microsphere formulation of timolol maleate, an IOP-lowering drug, that can be injected subconjunctivally and delivers timolol for 100 days. We have shown in vivo that this leads to timolol in the aqueous over 90 days. This means that patients could avoid drops and have better control of the disease. 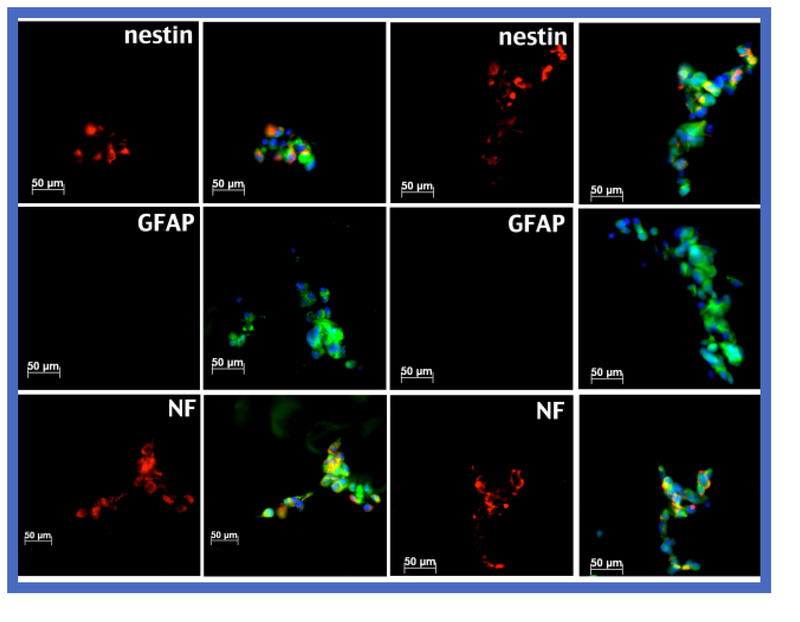 AG1478, a tyrosine kinase inhibitor, has been shown previously to promote regeneration of the optic nerve after injury but the drug has significant side effects which makes systemic delivery challenging. 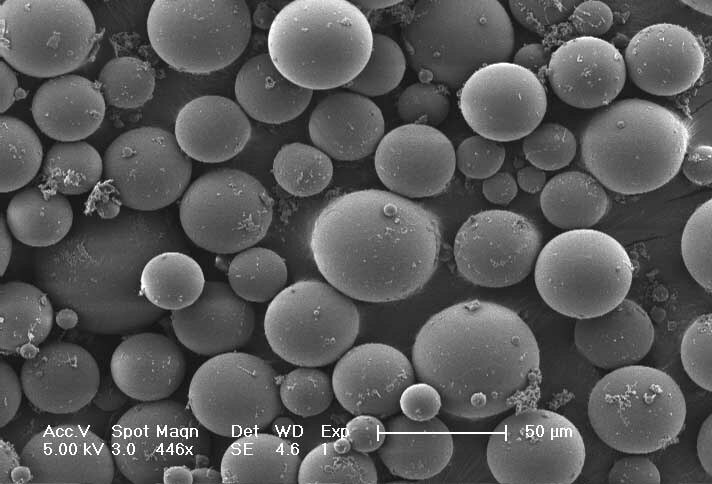 We encapsulated the drug in PLGA-based microspheres and nanospheres and then delivered the spheres intravitreally following an optic nerve crush injury. 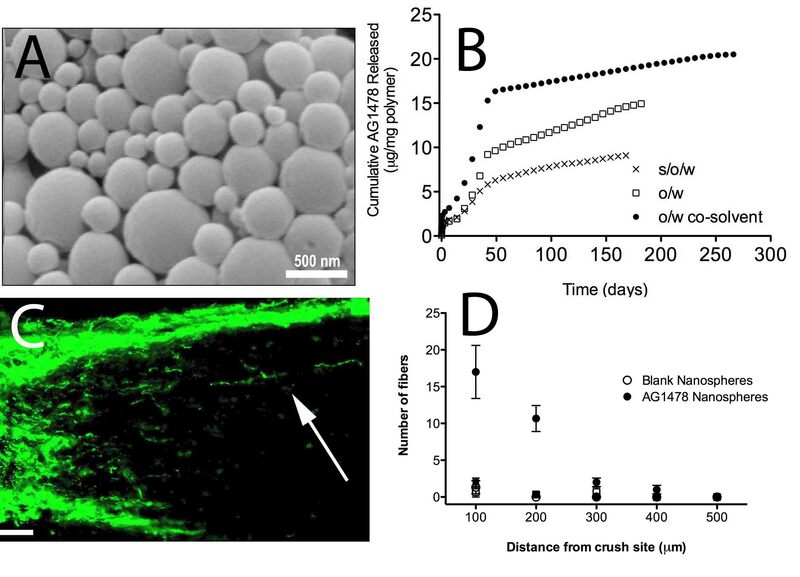 Sustained delivery of AG1478 promoted optic nerve regeneration several hundreds of microns beyond the crush site. Simple approaches such as this one are potentially translatable and represent a platform for delivery systems in the eye. Funded by The Glaucoma Foundation. Increases in blood vessel density have been correlated with improvements in recovery in a number of models of spinal cord injury. The question this generates is whether increasing vessels might promote recovery. 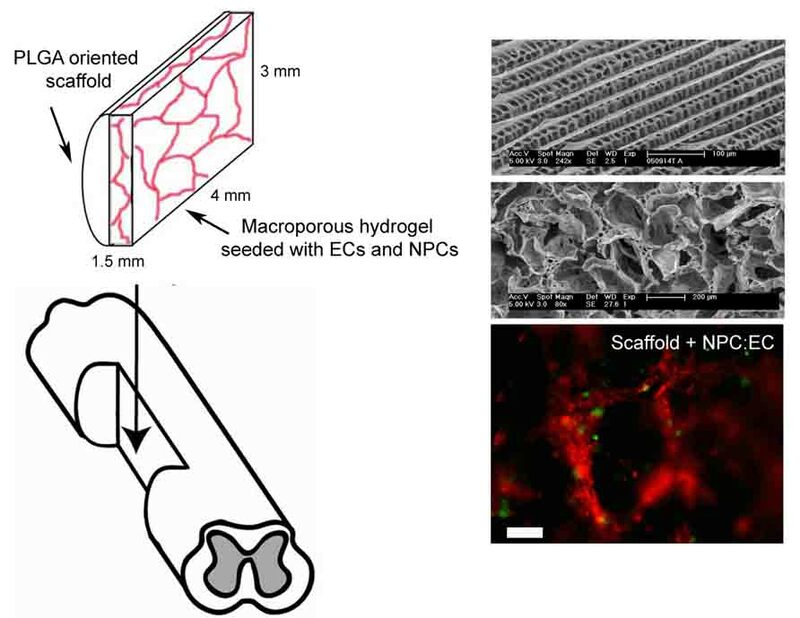 Using a coculture of endothelial cells (ECs) and neural progenitor cells (NPCs), we have built microvascular networks in a biodegradable two component implant system and tested the ability of this implant to promote angiogenesis following spinal cord injury. The coculture led to a significant increase in vessel density, with almost half of the vessels exhibiting positive staining for the endothelial barrier antigen (EBA), a marker for the blood-spinal cord barrier. In contrast, none of the controls exhibited the marker for the blood-spinal cord barrier. This means that we can build new vessels in the spinal cord after injury, and these vessels start to form the critical barrier to function properly. We are able to investigate the role new vessels play in repair after spinal cord injury and this may lead to new approaches for therapy. Understanding and directing the differentiation of NSCs is an important step in developing therapies for the CNS. 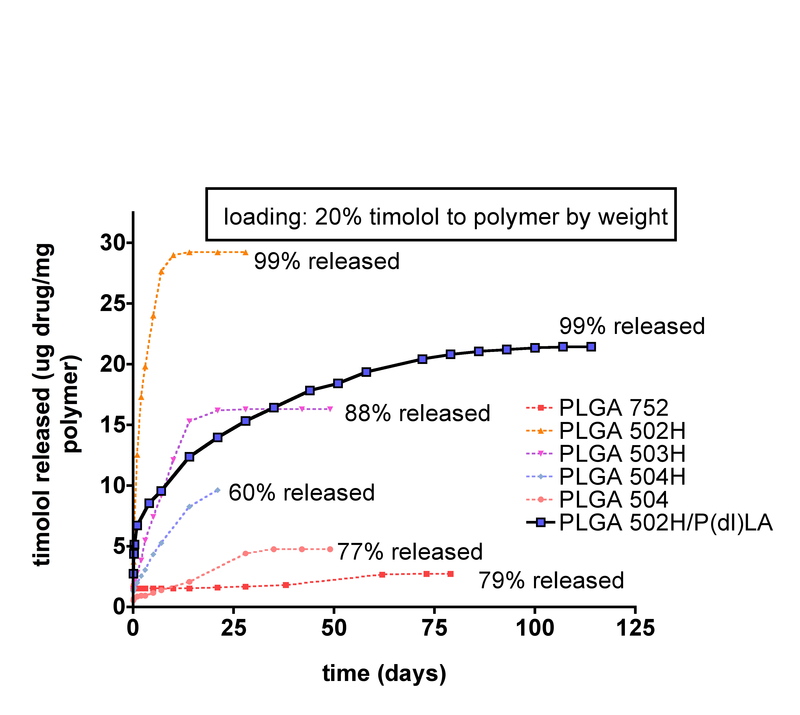 We have synthesized a library of chemically cross-linked poly-L-lysine/poly(ethylene glycol) (PLL/PEG) hydrogels as well as a library of photopolymerizable PLL/PEG hydrogels which promote the neuronal differentiation of NSCs as determined by the expression of neurofilament 200 (NF-200) a marker for mature neurons.These gels allow us to build three dimensional models of neural tissue including microvascular networks, and an model of the neurovascular niche. By building and studying these models we are able to understand the cues the direct development and the response to injury and disease.